An 18th century church designed in 1769 by Robert Adam on the site of the medieval parish church, which is depicted on a mid 18th century estate map. It is said to be the only Norfolk building by Adam, and his only complete church in the country. It has a large portico with Tuscan columns, with blind windows and niches along the exterior walls. Inside there is no architectural distinction between the nave and the chancel, and the church is decorated with wood panelling and a plaster frieze. The church was designed to be visible from Gunton Hall (NHER 6815) and as a prominent feature in the landscape of the park (NHER 30438). The grounds are private but there is access to the church. 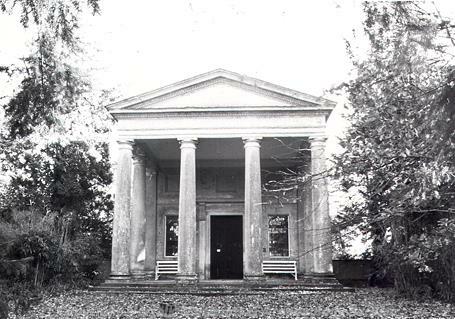 Rebuilt 1769 by Robert Adam in the form of a Greek temple. Brick; four column Tuscan portico, two columns deep on the sides. Pediment above. Façade of two blank windows, one each side of a large doorway with lintel supported on scrolls, and three small blank windows above. Rear elevation is the same with blank window replacing doorway. Side wall to south has four niches on lower floor and four windows above. Three of these cut a string course but the western one is smaller. The north wall is similar but the niches are replaced by blank windows. Frieze under cornice. Mounted on exterior rear wall is the Ivray monument of 1665. (S1) mentions other, 16th century monuments in the old church. Wing walls ending in short square pillars each side of portico, ventilators in the pillars and the steps indicate vaults beneath. Church redundant and key not available at time of visit. (S2) notes Corinthian reredos and gallery; plaster frieze; plate, chalice and paten, Norwich 1670; chalice, cover and jug 1774 by Boulton and Fothergill of Birmingham; amlsdish, London 1824. In 1832 a large haul of smuggled casks was found 'in an old vault in Lord Suffields plantation', see (S3). Some writers have assumed this was a vault near the church, but this is not necessarily so. E. Rose (NAU) 5 November 1981. In digging grave of  (located in 1981 at 6m east of east wall of church) a length of wall 'composed entirely of mortar' about 1m long running east to west top about 30cm (1ft) below surface, about 1m in height. Southern face only exposed. A map of 1754 reproduced in (S5) shows the previous church had a west tower, three south windows and a door but apprently no chancel at that time. E. Rose (NLA) 15 September 2000. The church is in the care of the Churches Conservation Trust (2006). The interior was examined February 2006. There are indeed vaults as suggested above, a plaque states they contain burials from 1741 (presumably reset from the old church) to 1894, plus two anonymous lead coffins. There is also underfloor heating. (S6) says that the present plan of box pews to rear, then open pews, is an alteration of 1894 from inward-facing seats; but (S7) states that the original plan focused on the pulpit and was changed to inward-facing benches in 1894, and then back again in 1918; but the woodwork is original and was only moved around. The chancel panelling is of 1894 but that at the west end includes an early 18th century garland salvaged from the Hall after the fire. (S7) compares the plaster ceilings to Blickling Hall. The gallery stairs have high quality balusters. (S7) states that the urns on the wing walls were stamped COGGAN LATE COADE 1824 but have been replaced by fibreglass copies for safety. The original organ came from Thorpe Market around 1820 and the west gallery was altered to take it; the wooden columns are in fact coated cast iron made when the present organ was installed 1907; it is of 1826 by Robson of London enlarged by Rayson of Ipswich 1907The east end has triple steps with marble inlay by W M Teulon 1894. The font is small, of onyx or marble. Basrelief monument to Cecilia Suffield 1911 by B. McKennal, and mid 20th century brass plaques to members of the Harbord family. Wooden memorial to those who served in the Great War (but not stating that any were killed). Royal arms George I, 1762. Altarpiece, copy of Florentine 16th century, given 1919.Five hatchments; Harbord Harbord (sic) 1735; Harbord first Baron Suffield 1810; William Assheton 2nd Baron Suffield 1821; Edward third baron Suffield 1835; Edward Vernon fourth baron 1853.The plate mentioned above has gone to Hanworth. There are fragments of 15th century tracery lying in the oval entrance lobby which (S7) states come from digging a grave in 1984 in the former chancel floor when a large Jermy slab was also found. A reference of 1790 to a figure of a knight in armour is quoted. This is clearly not the same as the finds mentioned above.The nave roof was seen by E Rose (NLA) in 2006. At the west end it is kingpost and strut with assembly numbers, and the original ceiling with an outline of the oval below; but the remainder was replaced after collapse in 1976, with a queenpost structure. --- Newspaper Article: 1976. Eastern Daily Press. 20 November. --- Newspaper Article: Eastern Daily Press. 1991. Park saved from dereliction. 29 July. --- Illustration: Unknown. 1987. St Andrew's, Gunton. --- Photograph: 1948. St Andrew's, Gunton (AA49/6063 and AA49/6067). --- Photograph: St Andrew's, Gunton (BB77/5944 and CC56/706). <S1> Serial: Blomefield, F.. 1808. An Essay Towards a Topographical History of the County of Norfolk.. Vol VIII. <S4> Correspondence: Birdsall, N. H.. 1980. Letter. 31 January. <S5> Monograph: Williamson, T.. 1998. Archaeology of the Landscape Park: Garden Design in Norfolk, England, c. 1680-1840.. BAR (British Series). Vol 286. p 85 illustration. <S6> Monograph: Pevsner, N. & Wilson, B. 1997. Norfolk 1: Norwich and North-East. The Buildings of England. <S7> Publication: Knox, T.. 2005. St Andrew's Church, Gunton, Norfolk.